Please join us at a reception on Sunday, December 6th, from 3 – 5 PM, in the Prosperity Grange (3701 Steamboat Island Road), to learn about the Steamboat Conservation Partnership and the Capitol Land Trust’s activities to protect land in our area. Wine, soft drinks, coffee and hors d’oeuvres will be served. 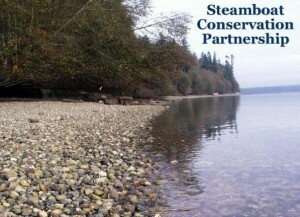 The Steamboat Conservation Partnership is a unique relationship between the Griffin Neighborhood Association and the Capitol Land Trust. The Partnership is designed to finance a portion of the Land Trust’s operating expenses in the Eld Inlet and Totten Inlet watersheds. These activities encourage the voluntary action of land owners to set aside rural tracts of farmland, forests, wetlands and coastal areas as conservation parcels left in their natural state. The Steamboat Conservation Partnership provides us with an incredible opportunity to preserve some of the special lands right here in our own neighborhoods. The Capitol Land Trust has a number of exciting projects in our area. Our contributions have helped fund the Capitol Land Trust’s efforts to encourage the voluntary action of land owners to set aside rural tracts of farmland, forests, wetlands and coastal areas as conservation parcels left in their natural state. Eric Erler, Executive Director of the Capitol Land Trust, will review the progress they have made to date. There will also be a slide show, maps and literature on the properties set aside by the Trust. Visit the Griffin Neighborhood Association website at http://www.griffinneighbors.org/scp to learn more about the Steamboat Conservation Partnership. Visit the Capitol Land Trust website at http://www.capitollandtrust.org/ to learn more about the Land Trust. If you can attend the reception, please RSVP by phone at 866-1214 or by email at s.lundin@comcast.net. Feel free to bring friends who are interested in the Steamboat Conservation Partnership. We hope you will be able to attend the reception, celebrate what our donations have accomplished, and socialize with our neighbors.